We spend a lot of time on Saturdays at each of the stores working to pair wines with the menus customers bring into us. I don't know why I never thought to write about it before. Here are some of my favorites...just remember, it never hurts to experiment. Linda and I once had an epiphany with sausage, spinach and fontina omelets with a big Aussie Shiraz. When pairing wine and food, there is never just one answer. Whether it's fish, fowl, pork or beef, the answer depends as much on the preparation, sauce and personal preference, as the meat. So when I write about wine pairing, you're reading what I like. Some of my favorites are a Côtes du Rhône or Châteauneuf du Pape with roast chicken or turkey. Make a chicken cacciatore and I go to Italy... try an Italian Barbera or Valpolicella. 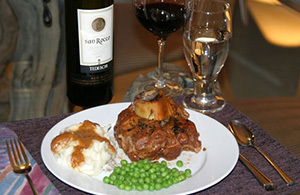 And speaking of Italy, how about the pairing pictured above, Osso Bucco with a Valpolicella Ripasso. Sangiovese-based wines like Chianti or Rosso di Montalcino always complement meat sauce Italian dishes. And what could be better than pairing Lasagna with Brunello di Montalcino. Grilled beef demands a California Cabernet Sauvignon or a big Argentine Malbec. Add a sauce and prepare it in the oven, and a more delicate Bordeaux-style blend or a Pinot Noir may be the answer. Roasted or grilled pork seem designed for a Syrah but add BBQ sauce and I think you're back to Malbec or Zinfandel. Lamb loves Pinot Noir, Syrah and the Rhône blends. Oysters and crisp Sauvignon Blanc are made for each other, but shellfish in general seem to sing with a bright Muscadet from the Loire Valley in France. Grilled salmon and Pinot Noir is one of my favorites. Poach it though, and find a Muscadet or a crisp Pinot Gris. Firmer fish like swordfish or grouper respond well to un-oaked Chardonnay, but add a tomato and onion-based preparation and Pinot Noir comes back to mind. Salty cured meats, especially ham, respond well to wines with a hint of sweetness, think Riesling. But, if you must have red, find a very fruit forward, even jammy, Syrah, Grenache or blend. Spicy food is another matter entirely. A lightly sweet Riesling or a spicy Gewurtztraminer almost always works with Thai, Hunan or Szechwan food, while I usually pair a big jammy Australian Shiraz with Mexican. Remember, it's all about experimentation... try something new!